After a 12h flight over the Pacific, Santiago welcomed us with spectacular blue skies and a nice view of the Andes. It felt good to feel the warmth of the sun again, as the weather in New Zealand had been pretty cold for the last few weeks. Dare we wish for no more woollypants? Crossing the Pacific meant that we went back in time 16 hours, which meant that we've had the worst jetlag ever. No matter how we tried to get to the local sleep rhythm on day one, we have been dead tired during the day and lying awake at night. It seriously has taken a week to function normally again. Somewhere in between the jetlag haze, we did some sightseeing in Santiago. Our slogan for China - "walk till you drop" - was successfully launched again:) After wondering around in the city, we took the cable car to Cerro San Cristobal, a hill in Northern Santiago. On the top you find a big statue of Virgin Mary and you can spend quite a long time there admiring the views of the huge city. 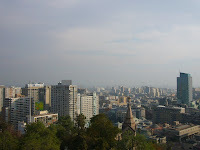 Population is almost 5 million, which means an impressive city silhuette but also smog. It has been a bit tough with our Spanish. Libor is the only one who has taken some kind of a beginner's course, so our English-Spanish phrasebook has been in good use. The best thing is that we learn new stuff every day, words are easy to remember and the grammar quite logical. I am still on this "where are the toilets" and "hotdog and beer please" -level, but the language wizard Libor could soon go for a political debate with his skills. Seriously. I don't know what has happened, but he understands the strangest sentences and laughs in the right parts. So if he is around, the trip runs really smooth. If it's only me, at least I can eat and know where the bathrooms are. And this hotdog (un completo) that I mentioned, is pretty much the best snack ever - smothered in guacamole, tomatoes and mayonnaise. Muy bien! After a few days in Santiago, we decided to head north towards San Pedro de Atacama, a village by the Atacama desert. Though South America has a reputation of being the continent for dreadful busrides with farm animals, this doesn't apply to Chile at all. Listen to this: seats folding into beds, free food, movies and toilets. So the 23h ride went smoothly indeed! 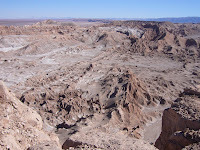 Atacama is the driest desert in the world and the nearby village of San Pedro de Atacama is located about 2300m above sea level. This makes the air dry and thin, and the nights very cold (so the woollypants are still around). On our first night we went on a tour, which took us to Death Valley, Cari Canyon and in the end the Moon Valley (Valle de la Luna) to watch the sunset. The salt in the canyon made the scenery look like it had just snowed, and you could hear the salt crack in between the rock walls. It was all very beautiful. We also visited the local museum - more cups I'm afraid, but once again some interesting history about the area. Yesterday we rented bikes and did a 30km tour to see ruins and devil's gorge. It turned out that our navigation skills were a bit rusty as we took a wrong turn somewhere, which meant an extra 2 hour biking in a rough "pro-mountainbiker" area. The mud was flying and we had to start carrying our bikes cross rivers, but still it took us over an hour to realise that this is probably not the nice little stroll that the bike rental advertised. My bum was also so sore that sitting on the bike seat was not an option anymore. In the end we made it back to town and after a great Chilean meal crashed and slept a normal night, for the first time in a week. The circle is complete and we are back in Auckland. We came a bit early, so we could sell our car. Usually, during this time of the year, every traveler is trying to do exactly the same thing as the high season just ended. However, we didn't have to wait long and got a few hits right from the beginning. We sold the car in a few days for $1300 (bought it for $1800), so not too shabby travel NZ for $500 :). Since then we have been exploring the wonders of Auckland and recharging our batteries for next adventures. There are plenty of places of interests around Auckland as usually in every big city. We started with a Museum of Transport and Technology (MOTAT) where there was a short term exhibit on movie special effects amongst other things. Unfortunately, it was not what we thought it would be as the interactive displays were more for kids, however, we did ended up seeing some cool old vehicles and they even had an old Czechoslovakian Jawa motorcycle. The next museum we have blessed with our visit was the Auckland Museum which is quite large and has a few floors. Each floor is focusing on different aspect of NZ and it surrounding areas. One has Polynesian arts and culture, another nature and from what I can recall the last one had a very extensive history on NZ war involvement and a great photographic display from the protests during French nuclear bomb testing in the Pacific. One of the main highlights of our stay in Auckland was a visit to a local rugby match where the Auckland Blues took on the Canberra Brumbies. Sadly for the Auckland folks the Australian team took the victory. However, I can't help myself to comment that the game was so so boring. Being it the first ever rugby game we have visited, I'd have to say, I might give it another shot with a national team or something, but otherwise I might just stick to ice hockey :). At least they are not on the ground 90% of the match :). Finally we have also had a TGIM in a proper Google fashion (well on Sunday :) with some of our visiting ex-coworkers. And where else would we go than a Irish pub, however, no Guinness tastes the same once you have tasted the real one from Dublin on top of the Guinness brewhouse. During the rest of the time, we have been splitting our time between many hours on internet (aren't you glad, otherwise you wouldn't be reading this), watching movies in the hostel, updating resumes and planning our next trip to South America. Finally, I have also cracked the 1000 page volume of Lord of the Rings without which no New Zealand experience is complete. Jenni has already read it, so she had one on me there. :) Now to our next adventures in South America, pickpockets and steaks, here we come.